Seeking an intimate and relaxed day with a lovely dinner, Courtney and Gideon invited their most near and dear to the wedding held at the beautiful Travaasa, Hāna Maui resort. Prior to the ceremony, everyone gathered in their oceanfront cottage to witness as they signed their marriage contract. The Ketubah, an integral part of a traditional Jewish marriage, it outlines the rights and responsibilities of the groom, in relation to the bride. 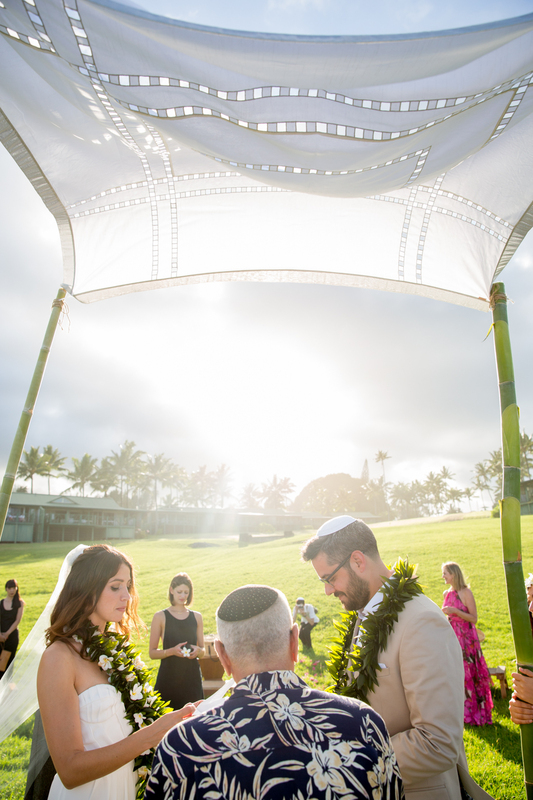 After the signing, the wedding party carried the custom Chuppah down the lush green lawn for the intimate cliffside ceremony. Courtney could not take her eyes off her groom as the Rabbi recited the Seven Blessings as part of the traditional ceremony. As the end came near, it was time for Gideon to Break the Glass, Mazl Tov! The evening ended with the small reception held poolside at the Makana Center of the hotel. Guests feasted on appetizers including Ahi Poke Wontons before sitting down to a plated dinner. The table, gorgeously set by planner, Hubert Aaron with tropical centerpieces from the talented Jessica of Hala Tropical Flowers. A perfect ending to the perfect day!